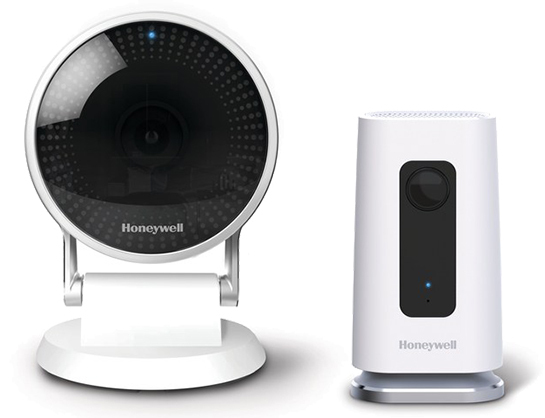 Honeywell today unveiled two indoor security cameras and confirmed plans to add HomeKit to its Lyric Security system at CES 2017 in Las Vegas. The semi-cylindrical Lyric C1 camera captures 720p video at 30 FPS with a 135-degree viewing angle, while the circular Lyric C2 camera records in 1080p at 30 FPS and has a 138-degree viewing angle. Both models have a built-in speaker and microphone for two-way audio functionality. Like other smart home security cameras, including the just-announced D-Link Omna 180 Cam HD and Canary's All-in-One Home Security System and Camera, the Lyric C1 and Lyric C2 let homeowners monitor their homes while they are away for extra peace of mind, with both motion and noise detection. The free Honeywell Lyric app enables users to control and view a live stream of their Lyric cameras with an iPhone or iPad. When the camera detects motion or certain sounds, users will receive notifications directly on their devices to get a bird's eye view of what's happening in their homes. Screenshots are also available. The cameras have wired power and connect to a home's Wi-Fi network to provide live streaming at all times. Recordings can be saved locally to an 8GB SD card included with every Lyric C1 and C2 camera, even if the home's Wi-Fi is not working. Free cloud storage per day is also included, with 7- and 30-day upgrades available. Honeywell said the new Lyric cameras will be available within the first three months of 2017. Pricing was not disclosed. Meanwhile, the Lyric Home Security and Control System, originally launched in 2016, will receive a software update with HomeKit support within the first three months of 2017, enabling homeowners to control the system using Siri voice commands or Apple's new Home app on iOS 10. 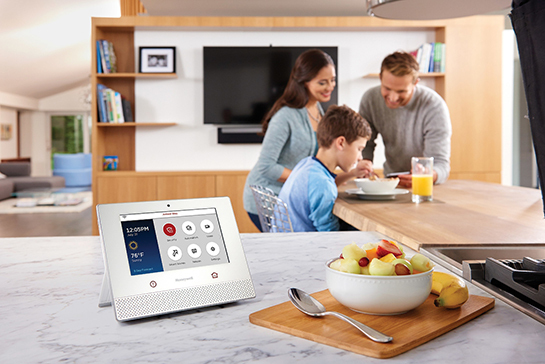 The Lyric Home Security and Control System is a pro-installed security monitoring system with a 7-inch touchscreen and built-in camera. If a Lyric sensor or motion detector detects an unusual situation, the system will provide visual and audible notifications and send alerts to a paired iPhone or iPad. AlarmGrid is cool because it's DIY w/professional monitoring and Alarm.com interactive services. And if you just want to self-monitor (No UL Monitoring) it with Alarm.com interactive services it's only $25 a month! That's cheap. If I were you though I would get 2GIG GoControl (GC3 is nice too but pricey). It's the easiest panel to learn and program new equipment. stalk and you shall find. So you answer with the cameras have night vision and I ask for a source from you and reply with "Stalk and you shall find." That's a poorly executed response, being you made a claim and failed To back it up. Respond with facts. Though I still have yet to need any IoT things beyond a thermostat. I already have cameras. Don't need anymore. I have a thermostat that I can control remotely. So good sir, apparently Honeywell has their own system? Their own monitoring service? I don't get all this. Does ADT sell Honeywell lyric. If I get Honeywell lyric, how is it different from being tied to adt. But no, ADT does not sell the Lyric. You have to go through a DIY alarm company to get the Lyric as far as I know. I myself have always been a customer of these traditional security companies. I started with ADT and am now with Comcast. I have just recently begun learning about these new DIY alarm security companies which are fairly new to the market and so, in turn, don't also have the years of experience as these bigger companies do, so that might affect your choice. But the Lyric system looks so good with it's HomeKit support that I'm deciding to switch over. Also because I've not had that much of a good experience with Comcast and I'll end up saving money with a lower monthly bill if I switch. However, I've learned that it works by you shopping and choosing which hardware you want (as sold through their website), you install the systems yourself, and in effect, you pay a lower monthly, don't pay installation costs, or have any cancellation fees. And I've read that the Lyric security system is very easy to install. There is still a central monitoring station that costs a bit extra a month to have the authorities contacted in case of a break in, just like any other traditional security company. If you have ADT with like a million door/window sensors. Can alarmgrid or Honeywell tap into them and make use of them. Or is it a brand new start? I know. I have a million door/window sensors too. I think the Lyric requires its own set of Lyric sensors, but not 100% sure on that. You can try asking alarmgrid customer support about it, which ive found to be really fast and helpful.